How to right an upturned lorry, and other useful advice. Homepage. 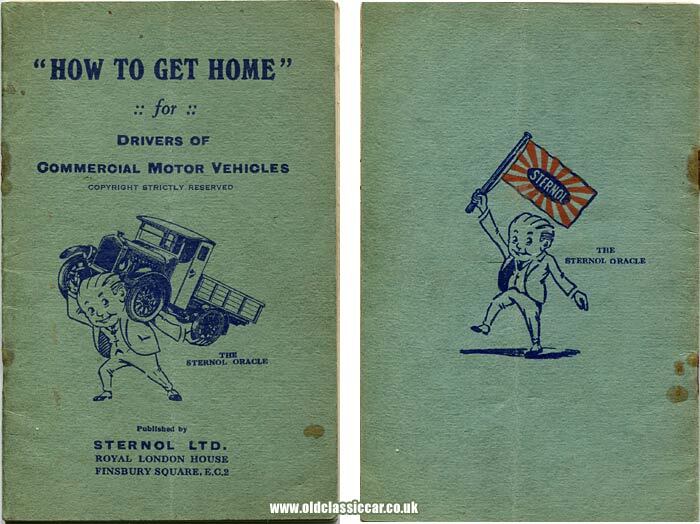 This page: Handy booklet produced by Sternol oils in the 1920s, with advice for lorry drivers. How To Get Home (published 1929). 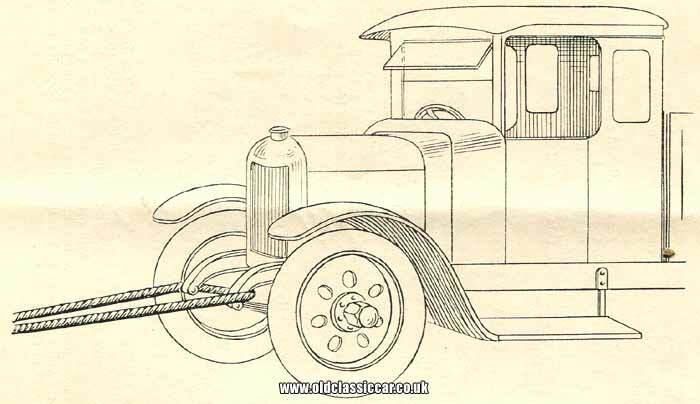 Driving lorries in the 1920s and 1930s wasn't a pursuit for the casual motorist. Draughty cabs, often open-sided, greeted many commercial vehicle drivers as they turned up to clock-in at the start of a long day behind the wheel. There was no power steering, or heating for that matter - unless you count the fume-laden warmth wafting up through the floorboards, a heady mixture of neat petrol, burnt exhaust gases and grease, laced with crankcase oil fumes. Anti-freeze was a luxury that few vehicle operators were prepared to pay for, so each morning radiators were being topped up at haulage yards across the land, followed by engines firing up after several swift swings on their starting handles. Operators of steam-powered lorries had it even harder, having to stoke up the heat in their fireboxes well in advance of actually turning a wheel in anger. Come rain, snow or shine, these hardy individuals, collars turned up, flat cap on head, and with a Woodbine hanging from their lips, readied themselves for the tough day ahead. If they were lucky, a driver's day would go to plan, with collection and deliveries being made in good time, enabling them to return to the yard and head home for a well-earned spot of shut-eye. However, with lorries and in fact any vehicle of the era, it was commonplace for things to not go remotely to plan, with breakdowns and accidents a frequent sight on Britain's roads. It was for these occasions that this booklet, produced by Sternol - a well known oil brand in the day - was designed, a handy pocket-sized guide to getting out of scrapes on the road. Hence the title, "How To Get Home - for drivers of commercial motor vehicles". The cover features the "Sternol Oracle" hauling a generic 1920's lorry home on his back. Who owned this book I don't know sadly, nor do I know if he used the advice within it during the course of his trade, and indeed which vehicle(s) he drove - Bedford, Chevrolet, Leyland or Ford, we'll never know. Wheels stuck in a muddy ditch. Throughout the booklet, different scenarios are dealt with one by one. While much of the advice is of no real relevance to modern-day motorists, I can't help but notice that some of the tips given would have come in handy at recent water-logged showgrounds, where many heavy (and not-so-heavy) vehicles became bogged-down in the mud, tractors having to extricate them. The first scenario is titled "Ditched", and discussed ways in which a driver could tie rope to the rear wheels of his lorry, to help him gain traction and thus drive out of his predicament. Where possible, it is advisable we're told to unload the cargo, making the vehicle lighter and more likely to drive out of a situation under its own power. Bricks, stones and wood can be placed beneath or in front of the driving wheels for example. Winding a rope in a spiral around a wheel might help on slippery grass or wet clay, but probably wouldn't be sufficient to help get out of deep mud. Better, the reader is advised, to place bricks or stones in front of the wheel, then tie rope around and around the wheel and tyre in one location, forming a thick band in one place. 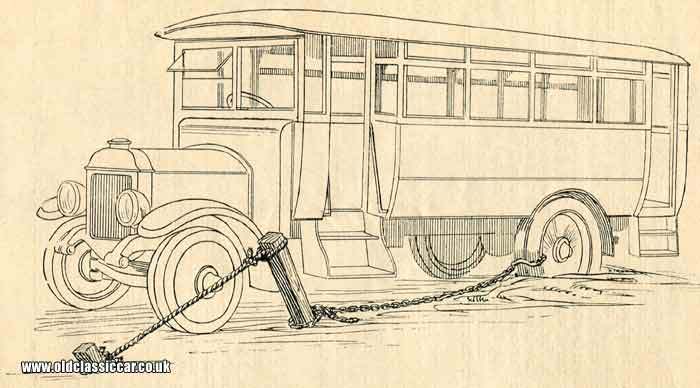 As the driver attempts to drive forward, the bound rope collects itself on the stones and, more often than not, digs into the stones and offers useful levels of traction. Being bogged down fully in a field or area being excavated is then discussed. If the previous suggestions fail, then it's out with the spade and time to dig the lorry out, opening out a slope ahead of the wheels giving the vehicle chance to gather some momentum, once rope or chain has been wrapped around between the (twin) rear wheels. The loose end should be pulled forward and tied to a post driven into the ground (as in the diagram below), and - for extra support - to a second stake further away. The idea is that the wheels will try to drive along the rope. The same trick can help remove a vehicle from a deep ditch at the side of a road. A lorry upside down, or rolled on its side. Rolling a vehicle over, whether fully or just onto its side, was (and still is undoubtably) a very real concern for any driver, especially those of tall, top-heavy vehicles. A vehicle on its side can (we're told) usually be righted by attaching a chain to the uppermost section of the vehicle's chassis, then given a tug by another vehicle of comparable weight, just so long as the road is wide enough to perform the operation. But what to do if the road is narrow, or otherwise obstructed? Here some ingenuity is required, and advice on this situation is given. 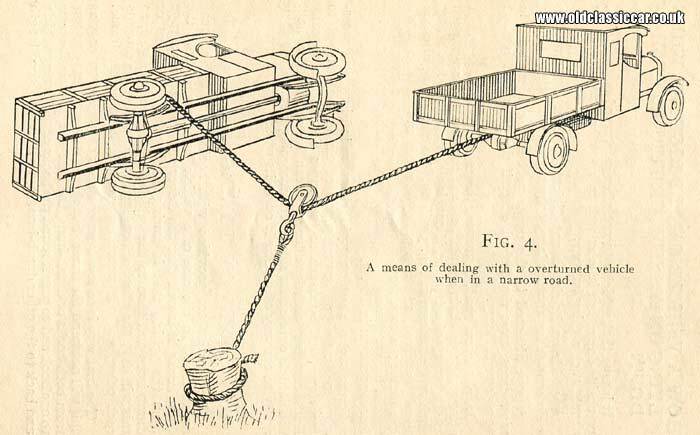 Hopefully a sturdy anchorage point will be available in close proximity, a hefty tree being perfect for the job, in addition to a suitably powerful tow lorry and, ideally, a pulley block as shown in the diagram. With everything in place, it should be possible for the tow lorry to pull at right angles to the overturned lorry, and right it without causing major damage to the lorry. Throughout, the advice is "can do" and very "hands-on", no picking up a mobile phone and calling in road haulage recovery firms, no health and safety - these were the days when people took responsibility for their own actions and, if they messed up, they'd simply knuckle down and sort it out, using common sense, assistance from willing helpers nearby, and a healthy dose of lateral thinking. If the vehicle was upside down, then a slightly different approach would be required. Interestingly, no tips on First Aid or thoughts for the driver's welfare make it into these pages, it's assumed he simply climbed out of any available open window in his cab, and "set to" with getting the show back on the road. 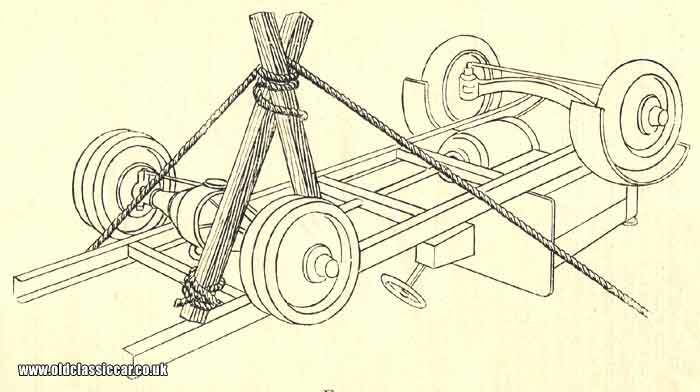 Where the vehicle was "belly up", it was recommended that two strong stakes were positioned as in the diagram below, enabling a tow vehicle to attach a line to the top of the improvised "A" frame, and give it a strong pull. This would probably get the vehicle onto its side, rather than back on its wheels, so the advice for an overturned vehicle could then be followed. Assuming the stricken vehicle was back on terra firma, there were no guarantees that it was still in a fit state to be driven away. Some tips on towing are given on page 11, first of which looks at where to attach a tow rope to. Threading a rope from one side of the chassis at the front to the other, around the dumb irons, was definitely not recommended. This could lead to the dumb irons pulling inwards, bending the chassis, something that would endear no driver to his foreman, especially after already rolling the lorry over. Not all roadside emergencies are as exciting as a vehicle going off the road, or getting stuck axle-deep in the middle of a swampy field. Advice on dealing with a stripped axle nut is given, the idea being to enable the roadwheel to be held in place sufficiently to allow a gentle drive back to a repair shop. A drop-side lorry, with its side-hinged rear body, can be used to good effect here. Drop the side down 180 degrees, rope it down in position, and it'll hold the wheel on (!). A lorry with a broken back axle can be dragged home backwards behind another lorry, so long as the steering wheels are strapped in the straight-ahead position. A leaking radiator, perhaps after a shunt, is another cause of drivers getting back to base long after closing time. In some cases a temporary repair could be effected by plugging the ends of the damaged radiator pipes with small pieces of wood, although gaining access wasn't necessarily going to be straightforward. Minor leaks could be cured by adding thin slices of soap to the coolant, the idea being that the soap would congeal wherever there was a leak, offering a modicum of sealing. This may well have worked on vehicles that relied on thermo-syphon cooling, but I'm not sure how well it'd cope with a system pressurised by a water pump. A broken fan blade will cause severe vibration issues if the engine continues to run in this state. The best bet therefore, if removing the fan altogether isn't an option, is to simply break off the blade opposite to the one that has snapped off, restoring balance to proceedings. The Hardy Spicer joint, where a joint comprises layers of canvas and rubber pressed together, was known as a "rag" universal joint. If one of these failed, perhaps in the drivetrain of a modestly-sized vehicle, or in the magneto drive assembly of a typical vintage lorry, then a temporary replacement could be fashioned from layers of sole leather, a product readily available (then) at boot repairers. Straightening a bent axle, or steering rod. The next example of sage advice would have been of interest to the gents who used to drive my own lorry after the war, and who tried to mow down a large tree with it one night returning from a race meeting, bending the front axle in the process. In fact they may well have had a copy of this book to hand, as they following its advice and dropped the axle off the vehicle, then dragged the mangled ironwork to a nearby blacksmith (asleep at the time), who straightened it for them in his forge. Focusing the heat on the damaged area only could be tricky, but could be helped by dousing the areas immediately surrounding the damage with cool water, to concentrate the heat in the area where it was actually needed. With the axle true once again, the process of annealing was recommended so that the part would not become brittle because of this repair work. Tips on dealing with a fire (for example beating it with one's overcoat, if a fire extinguisher isn't available) and also advice on keeping warm if stranded out on the road at night, then follow, as do some pointers on effective soldering, should the enterprising driver find that he needs to re-solder a union on a fuel pipe for example, while on a journey. Best practice with regard to brazing can also be found within this slim booklet's pages. As this booklet was produced by an oil supplier, it was inevitable that a list of their commercial vehicle lubricants would feature at some point. Four pages listing popular makes and models of lorry then follow, with recommendations for the best oil to use in their engines, gearboxes and back axles. Many near-forgotten makes of truck and other commercial vehicle are listed, including Caledon, Chambers, Day-Elder, Gotfredsom, Lacre, Pagefield, Sterling, Warrick Carrier and Whiting, to give just a flavour.